We’d love your help. Let us know what’s wrong with this preview of The Seeing Summer by Jeannette Eyerly. Carey fears her new neighbor Jenny, who is blind, will not be able to do everything she can but is surprised when both are kidnapped and survive the terrifying adventure. To ask other readers questions about The Seeing Summer, please sign up. One of my favorite books as a kid. I wish I still had it. Probably gave it away years ago. This review has been hidden because it contains spoilers. To view it, click here. This book is an inspiration to me beings that I am visually impaired it reminds me that I can do anything any cited person can do. This review has been hidden because it contains spoilers. To view it, click here. Ten-year-old Carey Cramer lives in a small Iowa town with her widowed father and their nanny/housekeeper, affectionately called Aunt Richard because she despises her first name, Edna. Carey's best friend Debra used to live right next door but has just moved away, and Carey is at loose ends. She is excited to learn that the new family moving into Debra's house has a daughter just her age and is full of plans for what they will do together; she's sure they will immediately become best friends. Care Ten-year-old Carey Cramer lives in a small Iowa town with her widowed father and their nanny/housekeeper, affectionately called Aunt Richard because she despises her first name, Edna. Carey's best friend Debra used to live right next door but has just moved away, and Carey is at loose ends. She is excited to learn that the new family moving into Debra's house has a daughter just her age and is full of plans for what they will do together; she's sure they will immediately become best friends. Carey's excitement turns to disappointment and confusion when she learns that the new girl, Jenny Lee, is blind. Carey has never met a blind person before and thinks Jenny will never be able to do any of Carey's favorite things. Aunt Richard orders Carey to go next door with a batch of cookies and introduce herself to the new family. And so Carey meets Jenny. Jenny is a sprightly girl who doesn't fit any of Carey's preconceived notions about blind people. She moves easily around her house and yard, cooks, and is annoyed with Carey's fumbling attempts to help her. Carey is unsure whether she and Jenny can ever be friends. But gradually, as Jenny and Carey spend more time together, they discover they have a lot in common. Both enjoy reading; Jenny using audiobooks and Braille, Carey using print. Jenny patiently teaches Carey to read and write in Braille, and the girls string up a coffee-can and pulley system linking their bedroom windows so they can pass secret messages back and forth. They play endless card games using Jenny's Braille playing cards, and walk into town for ice cream and to play in the park. It's on one of their trips to town that they have a rather odd encounter with a strange man who is buying a newsmagazine with a picture of Jenny's scientist father on the cover. To Jenny's discomfort, Carey lets slip just who Dr. John Talbert Lee is, and the man seems quite interested. But the incident fades from their thoughts until the next time they go to town. After a long afternoon playing in the park, Carey and Jenny are on their way home when Carey remembers that she was supposed to stop at the store and pick up a green pepper for Aunt Richard. Jenny waits on a bus-stop bench, but when Carey comes back, Jenny has disappeared. It soon becomes clear that Jenny has been kidnapped for ransom, and the next day, Carey slips out of the house to walk into town and look for clues. She isn't sure just what kind of clues she's after, but when she sees the same shuffle-footed man she and Jenny had met at the ice cream store, she impulsively runs after him and blurts out "Why did you steal Jenny?" This proves to be a very bad move. Carey finds herself kidnapped as well and taken to the warehouse by the railroad tracks where Jenny has been hidden. Jenny has held up well in captivity. The loft area she's kept in is pitch dark but that's no hindrance; using her cane, Jenny has explored the vast area and before Carey even arrived, discovered the Listening Spot, a place where it's possible to hear the two kidnappers talking on the floor below, and best of all, to hear their radio and its newscasts about the abductions. The kidnappers, which the girls have privately dubbed Shufflefoot and the Bearded One, are clearly amateurs, and after a day or so of captivity, Carey and Jenny realize they've been left alone in the warehouse. When no one seems to be coming to find them, Jenny urges Carey to explore further, and it's Carey who finds a ladder, which Jenny climbs up and discovers a door leading onto the roof. 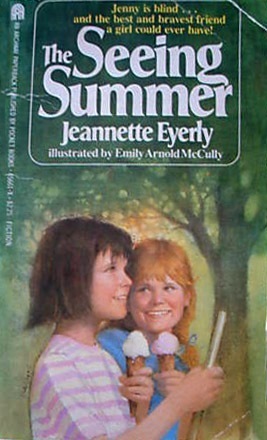 Carey is terrified of being up so high, but with Jenny's encouragement she joins her friend on the roof, from which Carey can see, and Jenny can hear, approaching sirens. And so, shouting from the rooftop, Carey and Jenny manage to get the firemen's attention and are rescued and reunited with their families. This is a wonderful book. When I was a child, it was difficult to find truly realistic books featuring blind children; most were on the dry side and not plot-driven, meant to educate more than to entertain. Jenny is a thoroughly believable character. She defies the usual stereotypes: she is bright, but not a genius; she is cheerful, but not saintly; she is independent, but not superhuman; and when Aunt Richard says that blind people are usually very musical, Jenny confesses that though her parents both play the piano, she herself is not musical at all. And Jenny has flaws like everyone else. She is at times impatient with Carey, and admits that she sometimes feels she has to show off in order to prove to people that she can do things they think she can't. The kidnapping plot was a bit over the top, but worked very well within the story. The only thing I found a bit problematic was the apparent ease with which Carey learned to read and write Braille. It isn't an instant thing, even for a child whose mind is at its most receptive to new things. Also, Jenny told Carey she was soon going to learn contracted Braille, wherein letter groupings and some whole words are condensed into fewer characters. Jenny has been blind from birth and is now ten years old. If she began learning Braille at the typical age of five or so, she should certainly already have been very proficient in contracted Braille at the age of ten. She wouldn't have found many non-contracted Braille books for her age level. An amazing book about friendship. About hope and disappointment, and about pulling through when times are tough. Jenny, the new girl, moves next door and shows Carey a truer meaning of friendship. When Jenny is kidnapped, Carey goes after her and gets caught as well. By the end of the summer, it's Jenny, the blind girl, who helps Carey see. This book was a fav as a kid. Mom unknowing that it was mine got rid of my paperback copy (thank you very much) and so I went to the Library this weekend to check their copy to re-read. Want to see if it's everything I remember it to be. Some of the language and references are very outdated (and the cover is just dreadful), but the story is entertaining, moves quickly, and helps readers understand what it can be like to be blind. Easy realistic fiction book, really short. Saw this book again and was reminded of my childhood of sitting down and enjoying this book so much. This was one of my all time favorite books as a child. I absolutely love this book! It relates to me in so many ways. I really did enjoy this book. YA adult author, pioneer of delicate, controversial subjects. Also columnist.